We’d love your help. Let us know what’s wrong with this preview of Eleanor Rigby by Douglas Coupland. Eleanor Rigby is the story of Liz, a self-described drab, overweight, crabby, and friendless middle-aged woman, and her unlikely reunion with the charming and strange son she gave up for adoption. His arrival changes everything, and sets in motion a rapid-fire plot with all the twists and turns we expect of Coupland. By turns funny and heartbreaking, Eleanor Rigby is a fas Eleanor Rigby is the story of Liz, a self-described drab, overweight, crabby, and friendless middle-aged woman, and her unlikely reunion with the charming and strange son she gave up for adoption. His arrival changes everything, and sets in motion a rapid-fire plot with all the twists and turns we expect of Coupland. By turns funny and heartbreaking, Eleanor Rigby is a fast-paced read and a haunting exploration of the ways in which loneliness affects us all. To ask other readers questions about Eleanor Rigby, please sign up. It’s been a dozen years (at least) since I’ve read Coupland. I remember being inspired by Generation X and feeling like I was a piece of living history. This was our time---He was writing about me. Oh, to be young and so self-absorbed. You can’t go home again, right? That’s the saying? Yet here I am feeling that Coupland has nailed it. He gives me faith. Time is whimsical and cruel.” Uh huh. Maybe I should talk about the book. Right. Stay on track. In front of me is a piece of notebook paper with page numbers and quotes scribbled all over it. I do this when I read something that elicits gooseflesh. 91, 92, 128, 130, 139, 117, 118, 179, 180, 57, 58, 229, 1. So, I’m not exactly sure how to review this book. I mean, I could do the standard book jacket rant, but that’s not me. I’m one of those irritating reviewers that likes to talk about how the book makes me feel and how it relates to me (see: self absorbed). Lately, I’ve been relating to that 4th self. That frightens me a little. It’s about farmers and fate and family and mystics. It’s seeing beauty in the ordinary and appreciating the surprises. It’s about painting one wall red. I loved this book. I love Coupland for stringing together words, for giving me my faith and still letting me be a skeptic. Lonely people want to be dead, yet we’re still not quite ready to go—we don’t want to miss the action; we want to see who wins next year’s Academy Awards. Doug Coupland’s Eleanor Rigby is tailor-made for dedicated readers fond of literature-focused social networking sites and who maybe, you know, sometimes think they should have more face to face interaction with other human beings but friends, in flesh and blood, can just be so exhausting. Liz, narrator and nondescript cubicle dweller, looks do Lonely people want to be dead, yet we’re still not quite ready to go—we don’t want to miss the action; we want to see who wins next year’s Academy Awards. Doug Coupland’s Eleanor Rigby is tailor-made for dedicated readers fond of literature-focused social networking sites and who maybe, you know, sometimes think they should have more face to face interaction with other human beings but friends, in flesh and blood, can just be so exhausting. Liz, narrator and nondescript cubicle dweller, looks dormant on the exterior but engages in the whirling, detailed thought processes of a lonely person who can watch her surroundings with impunity because most people have forgotten she’s there. She returns to her tomblike condo at night and, well, thinks some more. Still, even the most careful lonely people cross fortune, and Liz’s path includes German prisons, dead bodies near the railroad tracks, and space detritus falling at her feet. And therein lies Eleanor Rigby’s nagging problem. Coupland overuses absolutely groan-inducing plot developments, not just tugging at one’s heartstrings but grabbing on tightly and wrenching the goddamn hell out of said strings until you want to kick the author in the balls to make him let go. If he’s not tugging he’s swerving left to right with the dues ex machina like a sugar-addled kindergartner describing a trip to Mars. And why? I’m not entirely sure. The book doesn’t need all that tugging and swerving. Liz’s internal dialogues are excellent, and Coupland’s portrayal of a lonely person’s reflections and perceptions could carry the book on its own. The plot distracted me from the characters. The last thirty pages almost raised the rating to three stars, but…nah. I’d be lying. Had the book been longer I might have given up. I’ve heard The Gum Thief is great, so I’m going to check out that one. Coupland’s got promise. Eleanor Rigby, however, shoots off like a Roman candle just wet enough to disappoint. "All the lonely people, where do they all come from? ....Where do they all belong?" In the song, Eleanor Rigby and Father MacKenzie are lonely and so caught up in their own sorrows that they don't see the lives around them or reach out to others; they see only their own issues. Is this the way it has to be with loneliness? This story is warm and told with humor and reality. Liz Dunn is lonely. She admits it and waits for death. She sees no other way through life. She's short, overweight, plain, "All the lonely people, where do they all come from? ....Where do they all belong?" In the song, Eleanor Rigby and Father MacKenzie are lonely and so caught up in their own sorrows that they don't see the lives around them or reach out to others; they see only their own issues. Is this the way it has to be with loneliness? This story is warm and told with humor and reality. Liz Dunn is lonely. She admits it and waits for death. She sees no other way through life. She's short, overweight, plain, has no friends.....what does she have to offer the world? These problems engulf her (much as Eleanor Rigby's problems did her). Enter her son who she gave for adoption; a young man who spent his years in foster care, as lonely as one can get. The events that follow are funny, touching, sad, uplifting and warm. Coupland is a wonderful writer, getting to the heart of a matter in touching ways. He has a unique perspective. Didn't finish - couldn't finish. I mean seriously, the woman is called to the hospital to see the son she's never met, goes home to clean house and then joins him to crawl on the side of the freeway before bringing him home to make some eggs? If this was given to me in a workshop I would have suggested he go to McDonald's University instead of getting his MFA. "All the lonely people" would rather be alone than spend time with this book. Paul McCartney wrote about a spinster, not a spastic. This review has been hidden because it contains spoilers. To view it, click here. I am not Liz Dunn, though I do identify with her. Obviously, I don’t have a twenty-year-old son whom I gave up for adoption. But I can understand her almost ascetic obsession with solitude. I too am a solitary person; I tend to prefer the company of a good book and its characters to the company of good people. Unlike Liz, though, I must confess to having a social life. I have friends, though I may not “hang out” with them as often as most people do. And while some people may question its validit I am not Liz Dunn, though I do identify with her. Obviously, I don’t have a twenty-year-old son whom I gave up for adoption. But I can understand her almost ascetic obsession with solitude. I too am a solitary person; I tend to prefer the company of a good book and its characters to the company of good people. Unlike Liz, though, I must confess to having a social life. I have friends, though I may not “hang out” with them as often as most people do. And while some people may question its validity, my online interactions are a large part of my social matrix as well. So I enjoy being alone, but I am not lonely per se. 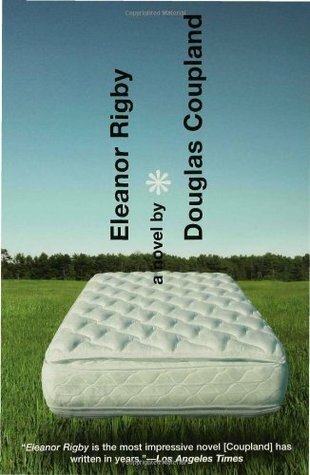 Loneliness and the often unexpected connections between people echo throughout Douglas Coupland’s works, but they come to the forefront in Eleanor Rigby. Liz has carefully ensconced herself in a bubble, fending off all but the most resilient of her relationships. And even these are routine, predictable affairs: her mother badgers her and tries to interfere with her life; her sister pities her for not wanting the life that her sister has but isn’t happy with; her brother accepts her but is wrapped up in a family and business of his own. The only wildcard in Liz’s life was the child she had while she was still in high school, a child who shows up twenty years later, precipitating a crisis of loneliness in Liz’s life. One reason I enjoy Coupland’s novels so much is that his characters always feel like people. They talk like people who are close to each other talk, in meandering conversations that branch into multiple topics as each person’s words spark new connections in others’ minds. It’s not at all like the straightforward dialogue of most novels, wherein dialogue is mainly a mechanism for advancing the plot. And it comes with a challenge, because of course fiction isn’t real life, and so one must balance the realistic dialogue with the needs of the story. It’s this ability to strike an equilibrium between the craziness of real life and the need for fiction to be believable that makes Coupland so compelling for me. This is a stark contrast to Coupland’s plots, which make very little sense and are always coated in a glossy layer of absurdity. Not that there’s anything wrong with that. Take the relationship between Liz and Jeremy for example. Jeremy’s reappearance in Liz’s life comes with a fatal complication: multiple sclerosis (MS). There is no happily ever after for these two, and Liz must face the fact that their reunion will be short-lived and complicated. I find it interesting that there is never any tension between these two. Liz accepts Jeremy’s reorganization of her life with equanimity. Similarly, Jeremy does no wrong. For a kid who had a rather rough time of it in foster homes, he seems to be largely untroubled. He doesn’t seem to have an ulterior motive, doesn’t seem to want to just take advantage of Liz, steal her stuff, and leave. Despite his awful luck in the foster home lottery, he somehow managed to turn out as a decent individual. Similarly, in the real world, Liz’s incident at the Frankfurt airport would have much more serious consequences than a slap on the wrist and a thorough decontamination. In Coupland’s novels, bad things happen, but they always seem so carefully calibrated to some precise degree of badness. This is how I know Coupland, for all his caustic observations of modern society, is an optimist and not a cynic. His endings are happy endings—not for every character, and maybe not even for the main character. People experience loss and sadness and death, but by the end of the book, something has changed for the better. Coupland’s novels are sneaky reminders that it’s never too late for hope, not even after an apocalypse, or peak oil, or the return of one’s twenty-year-old son. And then we come to the ending, which is, for me, the least satisfactory part of the book. It’s just dumb: Liz flies to Austria to meet someone she barely remembers from her past, and then they fall in love. I’m almost tempted to conjecture that Coupland lost a bet and was forced, as a condition of his loss, to write the ending this way. But I’m sure he had his reasons, not the least of which is the need to rectify Liz’s loneliness, which has returned since Jeremy’s death. Still, I think he could have done better. Coupland is renowned not only as a writer but as a visual artist as well, and I think this influences his writing to a great extent. That is to say, his books often seem to make more sense when viewed slightly from a distance, as a whole and complete entity, rather than viewing them up close and in a sustained, linear fashion. Paintings, unlike stories, are not meant to be read from left to right, page to page. And actually, I would probably say Coupland’s novels are more like sculpture or an installation piece than any two-dimensional art: different when viewed from different angles, with little jaggy bits sticking out. Eleanor Rigby the linear narrative is contrived and somewhat disappointing. Eleanor Rigby the work of art is stimulating and moving. It’s the perception of this difference (whether conscious or not), perhaps, that makes it possible to be a fan of Coupland. Because people who pan his books as contrived or curiously constructed are entirely right. This isn’t literature so much as it is visual art translated into the written word. The fact that this appeals to me is ironic, because I work at an art gallery but do not take much time to look at the art. I suppose this hasn’t been a review of Eleanor Rigby so much as a kind of rumination on my Coupland fandom. Try as I might, I’m finding it hard to pick out specific parts of Eleanor Rigby to praise, despite being able to find a few things I could criticize. I suppose I really enjoyed Jeremy’s newfound interest in selling mattresses. I don’t know if that’s just because it feels so quotidian and Couplandy, or if I secretly yearn for a series of novels that follows a mattress salesman. Mostly, though, I think Eleanor Rigby crystallized some of my conflicting thoughts and attitudes towards Coupland. He’s a better storyteller than he is a writer, but for all their flaws, his stories always seem to have nougats of truth. Douglas Coupland is one of those authors I think I’m supposed to really like, but with whom I’ve never quite clicked. I know he does the kinda snarky, sorta postmodernist literary fiction that’s usually my cup o’ tea, but for some reason he’s never joined the ranks of those authors whose work I regularly seek out. My first encounter with Coupland’s work was his first – and best known – novel, Generation X: Tales for an Accelerated Culture. I read this in the late 1990s, at the point when I was e Douglas Coupland is one of those authors I think I’m supposed to really like, but with whom I’ve never quite clicked. I know he does the kinda snarky, sorta postmodernist literary fiction that’s usually my cup o’ tea, but for some reason he’s never joined the ranks of those authors whose work I regularly seek out. My first encounter with Coupland’s work was his first – and best known – novel, Generation X: Tales for an Accelerated Culture. I read this in the late 1990s, at the point when I was entering my late 20s and not feeling much affinity with the generation that was supposed to define me. I was (am?) an Xer, but the book itself – despite being about my people – didn’t do much for me. A quick look at my bookshelf tells me that I also read Shampoo Planet, about which I remember exactly nothing. My first exposure to Coupland’s work actually came before either of these books, listening to half of Microserfs in audiobook form on a road trip to rock climb in Yosemite National Park. I have fond memories of that drive, but it’s highly likely the book may not have had much to do with it. All the hype on Coupland’s work tells me we should be literary BFFs. But here we are, with 2004’s Eleanor Rigby being only the third of his books I’ve read in twenty years. And the hell of it is, even after reading this generally pleasant book, I’m no closer to figuring out just what I think of him. The book is completely, resolutely fine. I liked it. It was a fast read. I laughed out loud once or twice. But I never fully engaged with the story in the way that makes a difference to a reader. "One of my big problems is time sickness. When I feel lonely, I assume that the mood will never pass – that I’ll feel lonely and bad for the rest of my life, which means that I’ve wrecked both the present and the future. And if I look back on my past, I wreck that too, by concentrating on all the things I did wrong. The brutal thing about time sickness is that naming it is no cure." I know that feeling exactly, the constant looking back and looking forward and dwelling on the present and being dissatisfied with all of it. (For me specifically there’s also a lot of what the late, great David Foster Wallace admitted to in a Rolling Stone interview, where he claimed to never have had a genuine human interaction because he was so plagued with social anxiety that he constantly stood one step outside himself, evaluating how his interactions with other people were going instead of just experiencing them. But that’s a story for another therapy session.) But somehow, despite the feeling that I knew Liz, her story was entertaining without really hitting home. And again, at the risk of sounding like a broken record, it should have. Because at the point where Liz’s loneliness seems to be transitioning into despondence, she receives an unexpected visitor: the son she gave up for adoption after a drunken fling in Italy at the age of 16 resulted in an unplanned pregnancy. Jeremy is now 20, has multiple sclerosis, and needs a place to stay. Liz takes him in without hesitation, and the act of becoming both a mother and a caregiver gives her purpose and meaning. Remarkably, Coupland manages to do this without ever dipping into schmaltz or sentimentality, at least partially because Jeremy himself is such an irrepressible figure. Rather than allowing himself to be a mopey victim of his debilitating condition, Jeremy gets a job as a salesman at a mattress store, gleefully selling its customers on “sleep systems” they don’t really need. I found it impossible to dislike Jeremy and equally improbable not to root for Liz as she haltingly emerged from her shell. It’s really, really good stuff. All of this plays out breezily, even after Coupland fast-forwards seven years and Liz finds herself arrested in Germany on suspicions of terrorism, which involves a plot twist whose intricacies I won’t reveal here. The fact that I found myself willingly entertaining these plot contortions (which also include a meteorite crash, Jeremy’s occasional bouts with prophetic visions, and flashbacks to Liz’s days in Italy) is a credit to the thoughtful way Coupland balances humor and pathos, and the sensitivity he pays to each of his characters – even Liz’s diminutive boss Liam (aka, The Dwarf to Whom I Report). But as I say, this book never clicked with me in the way I thought it should. I’m not sure what to chalk it up to, but I suspect it might have to do with this simple truth: I’m not lonely anymore. I can remember those feelings, but at a remove, like a photograph that’s started to fade in the sun. And because I don’t remember them fondly, Liz’s struggles carry perhaps just a bit too much verisimilitude for comfort, even though I found much in the book to otherwise enjoy. Which leaves me pretty much where I started: I still don’t know what to make of Douglas Coupland. Perhaps it’s enough to say that I’m willing to try another of his books to see if that’s the one to make a difference. I'm afraid I've long since passed my peak of patience with Douglas Coupland. I guess this isn't so much a review of Eleanor Rigby, as it is a review of anything I've read by him. I must have read at least 6 or 7 of his books and I think I could equally apply this review to most of them. The first of his I read was Jpod and I still enjoy that. I then read Generation X and I enjoyed that too. But with each passing book of his I've read, I've enjoyed them less and less. I don't know if that's a sign I'm afraid I've long since passed my peak of patience with Douglas Coupland. I guess this isn't so much a review of Eleanor Rigby, as it is a review of anything I've read by him. I must have read at least 6 or 7 of his books and I think I could equally apply this review to most of them. The first of his I read was Jpod and I still enjoy that. I then read Generation X and I enjoyed that too. But with each passing book of his I've read, I've enjoyed them less and less. I don't know if that's a sign of age (mine, since Generation X and Generation A are around 20 years apart and feel largely the same) or whether it's the books which are the issue. Initially, Coupland's novels seem witty, irreverent and somehow holding a deeper meaning in amongst the pseudo spiritual Armageddon scenarios he's been selling for years. The thing is, I find now that most of the characters are interchangeable. As are the plot lines. I cannot distinguish one story from another now. They're just so similar in so many ways. As a 19 year old I loved that intellectual bent his novels seemed to hold, but now I can't see it any more. I no longer believe that they are as smart as they believe they are. It all feels like posturing. Reading multiple Coupland books erodes any sense of weight you initially applied to his thoughts. I'd still recommend Jpod and Generation X to people who haven't touched anything by him. Especially if you work in software. However, I'd say pick three of his and leave it at that. Read any more and you'll ruin it for yourself. As for Eleanor Rigby, it's just pointless. Normally (I say normally, I mean every time) Coupland novels tend to weave their way to a bit of a non-ending. That's quite charming in most cases, but I just don't follow it here. This story never really has any satisfying moments to it. Some interlinked events happen. Some Coupland characters say some Coupland-ish things. At some arbitrary point, it ends. On an emotional level this novel was exactly what I was craving; a main character I could relate to, quirky characters and situations and lots of lovely little details. I could relate to the loneliness aspect of the book as I'm going through a particularly painful adjustment period in my life, feeling like I am starting over again in my thirties which I am finding harder to face and cope with as I get older. I noticed some of the reviewers had an issue with the more outlandish turn-of-events but I On an emotional level this novel was exactly what I was craving; a main character I could relate to, quirky characters and situations and lots of lovely little details. I also liked the idea of making the most of the time and situations you are given but not necessarily in a cheesy cliché way. Coupland has a way of taking a very thought about scenario and making it seem fresh and authentic. Non sono ancora sicura di cosa penso di questo romanzo. Sicuramente la narrazione in prima persona di Liz, che ci parla dal futuro e ha l'abitudine di evitare completamente un argomento fino a quando non è più possibile farlo, e quindi ci catapulta all'improvviso nel bezzo di un evento inaspettato, a volte anche estremamente surreale (sto pensando all'episodio dell'aeroporto in particolare), è avvincente, ma a tratti le sue riflessioni sulla solitudine e sulla mortalità (o semplicemente la morte Non sono ancora sicura di cosa penso di questo romanzo. Sicuramente la narrazione in prima persona di Liz, che ci parla dal futuro e ha l'abitudine di evitare completamente un argomento fino a quando non è più possibile farlo, e quindi ci catapulta all'improvviso nel bezzo di un evento inaspettato, a volte anche estremamente surreale (sto pensando all'episodio dell'aeroporto in particolare), è avvincente, ma a tratti le sue riflessioni sulla solitudine e sulla mortalità (o semplicemente la morte) riescono ad essere vagamente noiose. Nel complesso una storia di evoluzione personale che nonostante la trama e il finale riesce ad evitare del tutto la svenevolezza grazie ad una profondissima e dolentissima tristezza che risulta piuttosto affascinante. I was expecting a light, entertaining read, that I would enjoy but probably wouldn't contemplate much after reading, based on my previous experience with Douglas Coupland years ago. Picking up after the first several pages, which were a cliche depiction of lonely Liz Dunn, this was the case. However, the book inexcusably ended like Coupland needed to tidy up quickly and move on or else. I re-read the last pages, thinking maybe I'd fallen asleep and missed a transformation of events; I hadn't. I read this book at least once per year. It's not my favorite Coupland book, but it puts me in the mood to write. I picked this book up used, it's dust jacket missing. So I knew nothing about the book or the author. This was a different read for me. Not the kind of book i usually read. i liked the short snappy dialogue. It's a fun, light, quirky read. Never quite sure where it was going. So it was a nice break from heavier reading. This is my second book from Coupland, and again, I loved it so much. "Shampoo Planet" was slightly better to me, spoke to me more, but "Eleanor Rigby" is beautiful as well. I feel like Bukowski and Coupland are 2 authors who go so well together, if I read one, I need to read the other soon after. Minor spoilers in the form of quotes! What did I think? I think that Douglas Coupland is a brilliant writer, of course. This is only the second book of his that I've read, and while I didn't like it quite as much as All Families Are Psychotic (there were less characters and less dynamic plot things but it's also shorter so) I would still highly recommend it. And I'm apparently not in the mood for writing a long review today, so I'm just going to show you my bookmarks--there are like fifteen of th Minor spoilers in the form of quotes! "Point well taken. You know what?" "Let's go shopping for a fold-out bed this morning." All of these quotes make this book seem really depressing, I know... patience, friends, there is a happy ending. Klaus sat there looking at the tabletop, shiny, reflecting all those pretty little white lights. And here's where I made a leap. I said, "Klaus--"
He said, "Yes," but didn't look up at me. I placed my hand on the table in front of him. I said, "Klaus, you're lonely too, aren't you?" Liz Dunn is lonely. She’s overweight and bitter, with a nondescript office job and absolutely no one in her life except her mother and siblings. Her future stretches ahead, each day no different than the last, each year no different than the one before. The story begins in the summer of 1997. Hale-Bopp comet streaks across the Canadian skies, and Liz comes to a realization. From that moment forward, Liz decides to go with the flow. No more trying to control everything. All she wants from life is Liz Dunn is lonely. She’s overweight and bitter, with a nondescript office job and absolutely no one in her life except her mother and siblings. Her future stretches ahead, each day no different than the last, each year no different than the one before. The story begins in the summer of 1997. Hale-Bopp comet streaks across the Canadian skies, and Liz comes to a realization. From that moment forward, Liz decides to go with the flow. No more trying to control everything. All she wants from life is peace. She heads for home with a lighter heart and absolutely no idea that her world is about to turn upside down. Jeremy Buck is an unusual young man. He’s beautiful, charming and funny. He has visions of the end of the world. He is the son Liz gave up for adoption over twenty years before – the product of a class trip to Rome. Jeremy has multiple sclerosis. He is dying. Liz opens her heart and her home to her ailing son, determined to make the most of the time they have left. She learns that even the most simple things in life – dinner, watching a favorite television show, shopping – are more enjoyable when shared with someone else. Jeremy’s visions intrigue Liz. They are horrifying, beautiful and poetic. Liz saves them all – little scraps of paper she finds scattered around the apartment – tiny windows into Jeremy’s world. When Jeremy becomes to sick to write them down, she records what he says. It’s something solid to hold on to, to prove that he passed through her life. When Jeremy dies, Liz is devastated. Having tasted life with another person, she is unwilling to return to her bleak existence, but unsure how to move forward. Her life takes another unexpected turn when Jeremy’s father resurfaces. Propped up by courage gleaned from her experience with Jeremy, Liz travels to Vienna to face her past and finally finds hope for the future. I have been a fan of Douglas Coupland’s books since he published Generation X in 1991. His work is by turns haunting, funny, heartbreaking and irreverent. He has been labeled by critics “the spokesperson of Generation X,” but has resisted the title, claiming he speaks only for himself, not for an entire generation. His loyal readers disagree. Pop culture is the backbone of Coupland’s books. His references to things, places and events work together to create an incredibly strong sense of time and place. Girlfriend in a Coma is Vancouver in the 80’s and 90’s. Hey Nostradamus brings to life the horror of a school shooting similar to Columbine and takes a long hard look at the lives of the people left behind. Liz’s reminiscences in Eleanor Rigby evoke a perfectly typical 1970’s childhood. Those of us who fall into the “Gen X” group (born between 1965 and 1980) always find familiar landmarks in the pages of his books. Coupland’s greatest gift as a writer is that he “gets” people. He has an uncanny ability to crawl inside his character’s skin, dragging his readers along for the ride. His characters aren’t always likeable or glamorous, but they are always, always completely human. Dialogue rolls off the page in crisp sound bytes packed with wry humor and witty banter. Eleanor Rigby (yes, he did get the name from the Beatles’ song) is perhaps Coupland’s best book to date. He has matured as a writer. The acerbic wit of the early 1990’s has softened a bit – he is considering life from the other side of forty now, and seems to have a deeper understanding of the boomers he so ruthlessly impugned in Generation X. Coupland’s observations of modern culture are crystal-clear as ever, but his voice is wiser. "You have to decide whether you want God to be here with you as a part of your everyday life, or whether you want God to be distant from you, not returning until you've created a world perfect enough for Him to re-enter." I got more from this than I care to admit. Loneliness is something no one wants to admit to and it's scary and sad to think of a person's life slipping away year after year with nothing to look forward to and no one to share happiness with. It's tragic and also very real. It's a "You have to decide whether you want God to be here with you as a part of your everyday life, or whether you want God to be distant from you, not returning until you've created a world perfect enough for Him to re-enter." I got more from this than I care to admit. Loneliness is something no one wants to admit to and it's scary and sad to think of a person's life slipping away year after year with nothing to look forward to and no one to share happiness with. It's tragic and also very real. It's also a great fear of mine and most people probably. I would point out how implausible most of the events in the book were; but it was so heartwarming and careful as to make some of the most outrageous things seem like a real possibility. Sometimes truth is stranger then fiction anyway, right? And i like to believe after so many years of uneventful life, Liz was due a big dumping of eventful events....Did that make sense? Liz was pretty strange but aren't we all sometimes? I have more love for a character that thinks differently (not cute quirky) than someone who has a one-track mind with no other peak inside their life and personality. If I just want to hear about a girls infatuation with some guy I can go to a Justin Beiber concert, am I right? I also love the actual message that I got from it. I've heard it before but this said it differently and I appreciate that. Don't throw you're life away because you think this is all there is. Don't give up before you've even tried. Go after whatever you want. Whatever answer your searching for wont find you inside the four walls of your house. You've got to get up, go outside and look. Try something new, something you're scared to do, just because. Liz Dunnová má 36 r. a je naozaj osamelá. Chodí do práce, len aby vyplnila svoje dni, no práca je nudná. Zvieratá ani rastliny nemá, stretáva sa maximálne so svojou rodinou. Je tučná, nevyýrazná a hovorí, že aj z davu by ju filmári vyhodili práve pre tú nekonečnú priemernosť a prehliadnuteľnosť. Keď však opísala svojho šéfa ako duševného trpaslíka, začala mi byť sympatická. :) No ten deprimujúci byt, v živote s nikým nechodila a nemá priateľov - bolo mi z toho patrične smutno. Jej meno je známe Liz Dunnová má 36 r. a je naozaj osamelá. Chodí do práce, len aby vyplnila svoje dni, no práca je nudná. Zvieratá ani rastliny nemá, stretáva sa maximálne so svojou rodinou. Je tučná, nevyýrazná a hovorí, že aj z davu by ju filmári vyhodili práve pre tú nekonečnú priemernosť a prehliadnuteľnosť. Keď však opísala svojho šéfa ako duševného trpaslíka, začala mi byť sympatická. :) No ten deprimujúci byt, v živote s nikým nechodila a nemá priateľov - bolo mi z toho patrične smutno. Jej meno je známe pre anglicky hovoriacich - a podobne ako Eleanor Rigby z rovnomennej piesne Beatles patrí k ľuďom, ktorí sa musia vyrovnávať so samotou bez akejkoľvek nádeje, že ich stretne niečo zaujímavé. No niečo zaujímavé sa predsalen stane. Zavolajú ju z nemocnice k mladému mužovi, ktorý je jej príbuzný a to je obrovské prekvapenie. Nech už to znie ako klišé, jeho príchodom sa jej život zmení k lepšiemu. Knihu môžete brať ako štúdiu samoty a ako taká je to trochu deprimujúce čítanie. Knihu však môžete brať ako kroniku jedného života, kde malá nerozvážnosť v mladosti, môže mať celkom zaujímavé vyústenie. Kniha obsahuje ako smútok, tak aj iróniu a vtip, dokonca aj nejaké to zamyslenie sa nad životom či osudom. Eleanor Rigby by Douglas Coupland is the story of a lonely woman - as she reminds us about 16 times per page - who is home for a week recuperating from having her wisdom teeth removed, when she gets a call from the hospital. She's listed as the next-of-kin contact on someone she's never heard of. Turns out he's the grown child hat she'd given up for adoption when she was 16. The book is a little disjointed and it takes some really odd turns (like when she takes her lucky meteor with her to Germa Eleanor Rigby by Douglas Coupland is the story of a lonely woman - as she reminds us about 16 times per page - who is home for a week recuperating from having her wisdom teeth removed, when she gets a call from the hospital. She's listed as the next-of-kin contact on someone she's never heard of. Turns out he's the grown child hat she'd given up for adoption when she was 16. The book is a little disjointed and it takes some really odd turns (like when she takes her lucky meteor with her to Germany and shuts down the entire airport). And the end was so improbable it was completely predictable. Still, overall not a bad read. I felt this book to be quite cohesive and strong for Coupland (I've read about 6 others), although the book didn't move me quite as much as I expected. No real weak points and maybe a bit anti-climatic, but very enjoyable to read, as his social observation was very sharp throughout. Overall, I thought it was more cohesive, but less ambitious than Girlfriend in a Coma. Meh. I kind of didn't remember reading this. I do remember thinking, really? Then I told Rachel that I didn't really know why she passed this one along, and she also didn't remember reading it. Unmemorable and kind of relying on my (nonexistent) pathos a little much. I don't know how to review books. The author did a splendid job on describing loneliness but I don't know what to make of this story otherwise. So much weirdness that didn't seem to serve any purpose. I think the deeper meaning, if there was any, was lost on me. I found this book to be less than memorable. I don't see how anyone can find the characters in this book interesting, let alone compelling. Coupland needs to abandon the quest for "quirk" and try maybe writing something effective, or at least memorable. Giving up halfway through. I wanted to love this book but the plot kept getting flimsier as it went. Even though the content was serious, it just felt silly. Douglas Coupland is Canadian, born on a Canadian Air Force base near Baden-Baden, Germany, on December 30, 1961. In 1965 his family moved to Vancouver, Canada, where he continues to live and work. Coupland has studied art and design in Vancouver, Canada, Milan, Italy and Sapporo, Japan. His first novel, Generation X, was published in March of 1991. Since then he has published nine novels and sever Douglas Coupland is Canadian, born on a Canadian Air Force base near Baden-Baden, Germany, on December 30, 1961. In 1965 his family moved to Vancouver, Canada, where he continues to live and work. Coupland has studied art and design in Vancouver, Canada, Milan, Italy and Sapporo, Japan. His first novel, Generation X, was published in March of 1991. Since then he has published nine novels and several non-fiction books in 35 languages and most countries on earth. He has written and performed for the Royal Shakespeare Company in Stratford, England, and in 2001 resumed his practice as a visual artist, with exhibitions in spaces in North America, Europe and Asia. 2006 marks the premiere of the feature film Everything's Gone Green, his first story written specifically for the screen and not adapted from any previous work. A TV series (13 one-hour episodes) based on his novel, jPod premieres on the CBC in January, 2008.